Thunderstorms will develop this afternoon and could lead to locally excessive amounts of rainfall. Severe thunderstorms are not expected, however. A stalled out frontal boundary has been sitting to our south since late last week. 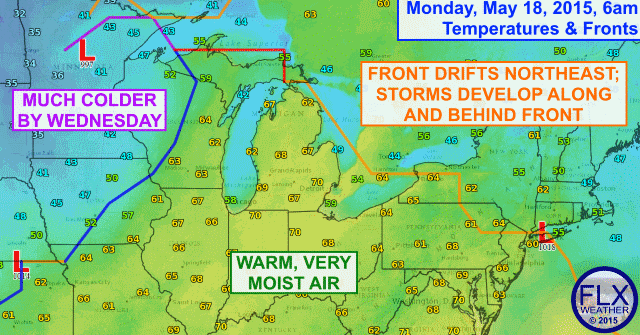 Finally, this front will push north through the Finger Lakes area, resulting in a very moist air mass settling in. With temperatures climbing into the low 80s early this afternoon, high amounts of moisture, and favorable upper atmospheric conditions, thunderstorms should easily develop this afternoon and linger into this evening across the Finger Lakes. Winds throughout the atmosphere are very weak. This is good news in that severe weather is unlikely, However, the bad news is that thunderstorms will be slow moving and some areas may see multiple storms, one after another, in a process called ‘training’. This could lead to excessive amounts of rain falling in some localized areas. 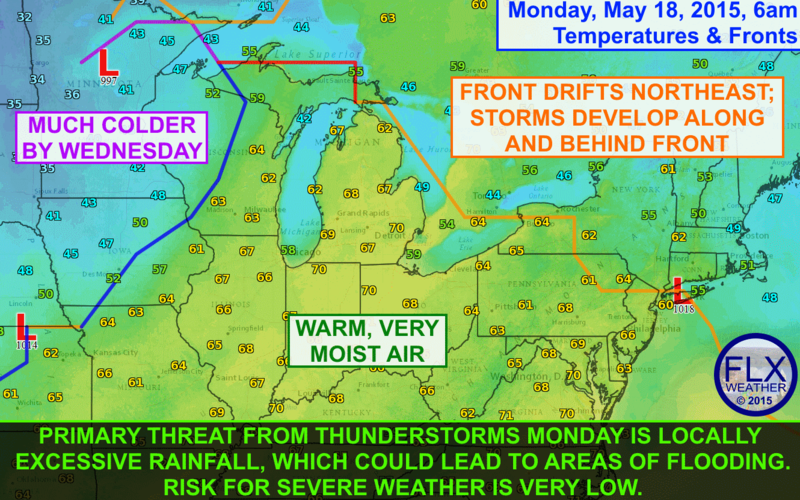 While it has been dry lately, there is some concern for flash flooding with these thunderstorms. Current flash flood guidance shows than most of the region can take 2″ to 2.5″ of rain in a 6 hour period before flooding becomes an issue. This should help prevent widespread problems, but I can easily see some areas getting that much rain. Showers and storms will continue into the evening hours before tapering off later tonight. Please remember to never drive through flood waters, especially at night, as it is impossible to tell if the road beneath the water still exists or if it has been washed away. A few more showers will be possible on Tuesday, but most of the action will likely be east of the Finger Lakes as a cold front moves through. Similar to last Wednesday, temperatures this Wednesday will struggle to reach 50º as cold Canadian air moves in. Unlike last week, the temperatures will be slow to rebound, with highs hovering around 60º- or some 10º below normal- into the first part of next weekend.